I can’t remember where I found this recipe, I saw it somewhere online and quickly wrote down the ingredients and directions. This is such an easy recipe and always a hit whenever I make it. I try to make this for my dad a couple times a year, he has always loved Butterfinger candy bars. He used to take one in his lunch every day and no one else was allowed to eat them. Enjoy! Mix and bake cake according to the package directions, also adding in the 1 cup of sour cream. Bake in a 9×13 inch pan. While still warm, poke holes all over the cake using the end of a wooden spoon. Pour caramel over entire cake so it can drizzle into the holes. Cool in the refrigerator for at least 30 minutes. Spread whipped topping over cake. 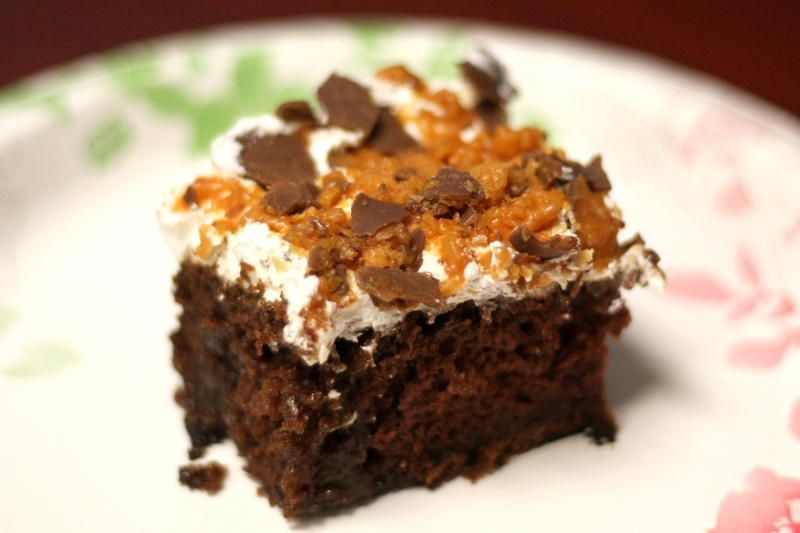 Crush candy bars and sprinkle over cake. Store in the refrigerator. Enjoy!